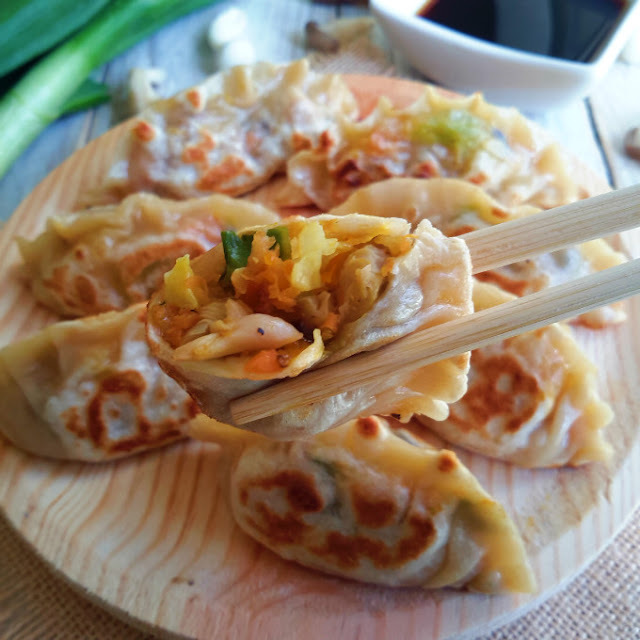 These vegan potstickers are better than takeout with a tasty mushroom and veggie filling and homemade wonton wrappers to ensure that they’re vegan! Once you’ve mastered these bad boys, you’ll never order takeout again! The first thing you’re going to need is vegan wonton wrappers. You can get them in some supermarkets but many of you have commented that they’re not that easy to find. So that’s why I did this recipe for vegan wonton wrappers. As you’ll see in the video, it’s simply flour and water and it’s one of the easiest types of dough to make. Heat 1 tablespoon of oil in a large pan over medium-high heat. Add the chopped onion and white parts of the green onions and fry until softened. Add the garlic and ginger and fry until fragrant – about 2 minutes. Add the mushrooms and fry for a further 5 minutes or until soft and beginning to brown. Add the carrot, cabbage, green parts of the green onion, salt and pepper and fry, stirring, until the cabbage is soft but not limp – about 2 to 3 minutes. Remove from heat and stir thorough the sesame oil. Allow to cool on the counter or in the fridge. Once cool, assemble your potstickers. Place a small teaspoon of the filling in the centre of a wonton wrapper. Wet the edges of the wrapper with water. Fold the wrapper over the filling and pinch the edges together to seal. Place them upright on a plate, being careful not to let them touch or else they will stick together. Heat 1 tablespoon of oil over medium-high heat in a large pan. Add the potstickers and fry until browned on the bottom – 1 to 2 minutes. You may need to work in two batches if not all your potstickers fit in the pan. Add 1/4 cup of water, cover the pan and reduce heat to medium. Allow to steam until the tops are tender and the water has evaporated – about 2 to 3 minutes. Uncover the pan and flip the potstickers onto their sides to brown on each side (optional). Remove to a serving dish. In a bowl combine the soy sauce and rice vinegar to make a dipping sauce and serve alongside the potstickers. Note: Use store bought or make your own with this recipe. 0 Response to "Vegan Potstickers"